It's hard to find a more thoughtful celebrity on the red carpet and Lady Gaga's flawless Oscar ensemble is further proof that every inch of a Gaga-approved outfit is carefully considered. After early buzz for A Star is Born, Gaga knew she was no longer a Best Actress contender in what would eventually come down to a two woman race between Olivia Colman and Glenn Close, but she still dressed the part on every single occasion. Her awards season journey came to a head at Sunday night's Academy Awards in a black strapless Alexander McQueen dress, but it was the breath-taking Tiffany & Co 128-carat diamond that was the centrepiece of an otherwise understated look. The last person to wear it? Audrey Hepburn in the 1960s. Colman, who walked away with the statue last night, chose a custom Prada gown, which she worked on for months alongside her stylist Mary Fellowes and the team at the Italian fashion house. "It was clear all around that emerald should be the principle hue," Fellowes told Vogue, adding that she later found out the colour held special meaning and is considered "the colour of hope and change in mythological terms." Her The Favourite co-star Rachel Weisz's red Givenchy latex and tulle two-piece was a way of bringing haute couture to the red carpet and, as such, divided fashion critics. Emma Stone, who has been championing Louis Vuitton suits in recent months, chose a structured sequin gown with ruffled shoulders by Hedi Slimane for Celine. Regina King, who won the Best Supporting Actress award, opted for classic elegance in a strapless Oscar de la Renta gown with a high slit and dramatic train and the choice of dress was a thoughtful one. "I felt like this film is a film about the fabric of America, one of the threads in the fabric of America, and Oscar de la Renta is an American designer, so I thought it was appropriate,” she said on E! News. 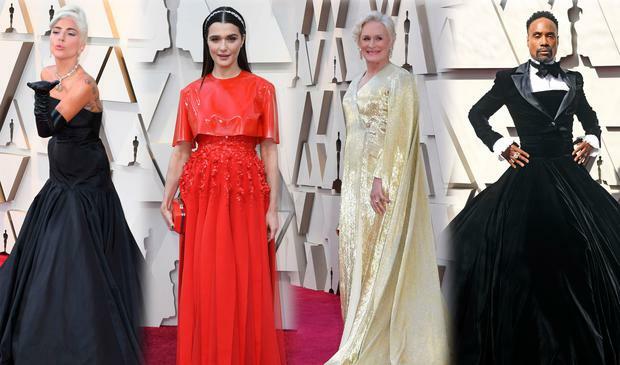 Shimmering fabrics of all sorts dominated the event with Glenn Close putting up a worthy fight for best dressed in a gold Carolina Herrera gown with breathtaking cape detail - and more importantly, it has pockets. A true feat of ingenuity. Black Panther star Danai Gurira was presenting an award and dressed the part in a strapless foil gown by Brock. Jennifer Lopez shimmered in head to toe silver by Tom Ford, Brie Larson chose a similarly hued halter dress and Amy Adams turned heads in a corseted Versace gown. Charlize Theron debuted a new dark hairstyle, which complemented her ice blue Dior dress with Bvlgari jewels. On the other end of the spectrum was an array of frills, ruffles and shocking colours like Gemma Chan’s high neck Valentino gown, Helen Mirren’s pink tulle number and even Linda Cardellini’s divisive pink feathered bow dress by Schiaparelli Couture injected some colour into an otherwise muted – and underwhelming - red carpet palette. This year, the focus was evenly divided with men putting on a strong show on the red carpet including Bradley Cooper - who brought his partner Irina Shayk and mother Gloria as his date - in a classic black tuxedo, but it was undeniably all about the velvet suit jacket. Chris Evans chose a pale blue velvet blazer to add some edge and Michael B. Jordan, who also brought his mother Donna as his date, opted for a midnight blue Tom Ford, while Irish actor Allen Leech went for classic black. However, the runaway star from the red carpet is Billy Porter, who has been redefining gender constructs in clothing and wore a custom tuxedo dress by Christian Siriano. Jason Momoa, who attended with wife Lisa Bonet, had Fendi make a custom scrunchie to tie hair back later in the night while still matching his suit. Chris O’Dowd, from Roscommon, and wife Dawn O’Porter, were also guests for the first time this year and they took their usual down-to-earth approach to awards ceremonies: Dawn did her own hair and makeup and dazzled in a vintage find, while Chris flew the tiniest Irish fashion flag, adding an emerald green pocket square to his navy blue suit. Cartoon Saloon CEO Paul Young, whose animation Late Afternoon was up for Best Animated Short, and Yvonne Ross Gold also brought a little bit of Ireland to the Dolby Theatre – not to mention that Yvonne, a jewellery designer, oozed Old Hollywood elegance in a custom design by Laura Jayne Halton, who is based in Maynooth. Ed Guiney, who produced one of last night’s big winners The Favourite, attended with his wife Aoife O’Riordan, who dazzled in a green sequin wrap dress. Bono’s daughter Jordan Hewson, fresh from landing a spot in Forbes’ 30 Under 30, was in attendance at the Vanity Fair Oscar party, opting for a plunging metallic gown with oversized bow, as she walked the red carpet with boyfriend Diego Osorio. With this year’s ceremony trouble filled, it made sense that the after-parties would boast most of the jaw-dropping looks, including Chrissy Teigen in Marchesa, Lupita Nyong’o in Oscar de la Renta and Miley Cyrus walking away in some of the best looks of the night. Caitlin McBride There's been something looming in the air this awards season - something that is, dare I say it, actually a little bit exciting?